Where can I find the Mobile view editor? How do I use the Mobile view editor? When you publish your Website Builder site, it automatically gets optimised for mobile devices, provided that mobile view is activated. Additionally, you can change the order of components from the Mobile view editor allowing you to move a picture above text, or vice versa. Note: The Mobile view editor is still in Beta and at this time it's only possible to move components up and down. We will add more features in the future. You can go to the Mobile view editor by clicking the mobile icon in the green bar at the top of the screen. To return to desktop view, click the desktop icon that will become visible in the same location. Mobile view needs to be active to be able to use the optimising feature; use the toggle in the bottom left corner to activate it if it's currently disabled. Changes you make here, will not affect the order of components in desktop view. Use the arrows to the right to move components up or down or use your mouse to drag and drop. Components that are placed on top of an image or in the same box form a container and cannot be separated. You can move the whole container up and down, or move components inside the container. If a component is located at the bottom and has a blue border with a padlock, this means that it is part of the template and locked to the bottom. You can change this behaviour in the properties for the component in the desktop view editor. 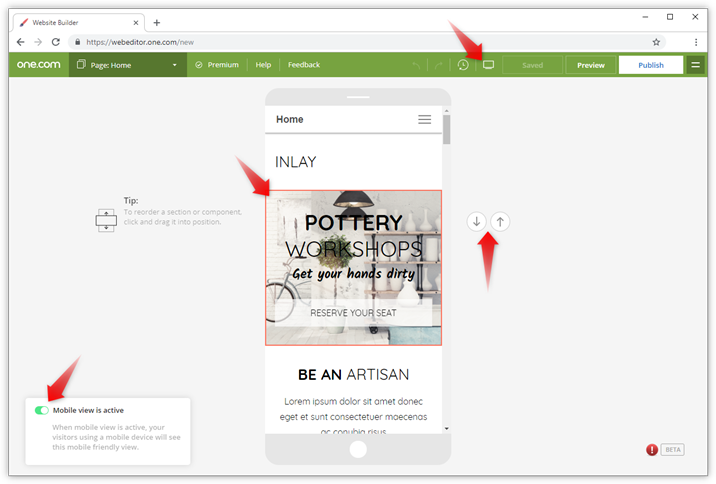 If you cannot find a component in the mobile view editor, this means it is set to be hidden in mobile view. You can change this behaviour in the properties for the component in the desktop view editor. 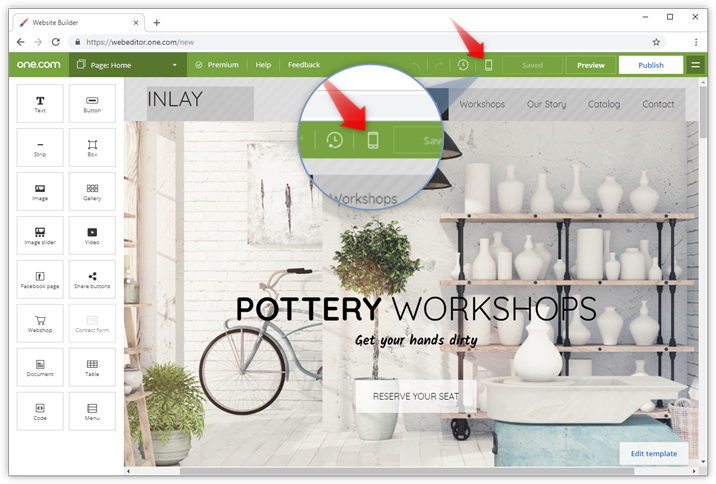 You can change the active page of your site from the pages menu in the green bar, just like from the desktop view editor. Go to Preview, when you want to navigate through your site and check how it behaves in both mobile and desktop view. How do I add a meta description in Website Builder?